Respiratory diseases are a leading cause of mortality in Canada, accounting for upwards of 15% of deaths and nearly $6 billion in direct health care costs. While there are several factors that contribute to respiratory disease (e.g. genetic susceptibility), exposure to cigarette smoke remains the foremost preventable risk factor for developing chronic respiratory diseases, particularly lung cancer and chronic obstructive pulmonary disease (COPD). COPD is a complex disease for which there is no cure. For individuals afflicted with COPD, there are also no effective therapies that can reduce severity or disease progression. This is due, in part, to a lack of novel intracellular targets for the development of pharmacological therapies. The research in my lab therefore centers on indentifying and understanding cellular and molecular mechanisms that control two processes which are dysregulated in many lung diseases (including COPD)- apoptosis and inflammation. While there are many cellular pathways that regulate apoptosis and inflammation, a receptor called the aryl hydrocarbon receptor (AhR) may play a key role. 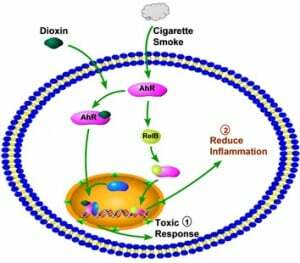 This receptor is well known in the field of Toxicology as the dioxin receptor because it is activated by the powerful man-made environmental contaminant, dioxin. Upon its activation by dioxin, it causes toxic and teratogenic effects (Figure 1, pathway 1). Although the physiological role and endogenous ligand of the AhR remain unknown, we have published that expression of the AhR serves as an inflammatory “brake” and attenuates pulmonary inflammation caused by cigarette smoke (Figure 1, pathway 2), both in vivo and in a population of lung structural cells called fibroblasts. We also found that the ability of the AhR to dampen inflammation required RelB expression, a member of the NF-κB family of transcription factors.